In game you might know me as MrVoidKnight. I wander through chat and forums trying to help players as much as I can and most of my work is to collect feedback and bug reports, and create tickets about them on GitHub for the development and narrative teams. I also test missions and help the narrative team to make sure that missions don’t make their way into the game before they are bug-free. Likewise, I help StarGazer by creating appealing news for Social Media about everything that revolves around gameplay as well as Science Fiction/Space news. Basically, what I am trying to do is to help the team by any means that I can and do my best to be the link between the players and the devs. In real life my name is Marvin, I am 23, I live in Bordeaux, France and I study Cognitive Science with a strong focus on disabilities and accessibility. I am also a gamer with a great love for RPGs in general and MMORPGs in particular. What I love about this genre is the discovery of far away worlds, the possibility of merging your own personality with that of a new person that you want to embody. The thrill of living magnificent adventures with your mind and sharing it with others who share the same passion for stories. Stories are also one of my favorite things in the world. I am always amazed at how simple words in the hands of a good narrator, mere sentences, can become incredible tools to make us dream and travel. To me, RPGs are not just games, they are complete experiences that can makes us feel, laugh, cry, hate, live by the means of a character which isn’t us but which actually becomes us more and more as you venture by his side. This character that you helped to create lives in another universe so far away that it might not even exists, but they feel so close to our hearts that they begin to really be. Now that you know a little more about me, I will try to explain what led me to Tau Station and why I was so lucky to be taken in. In order to validate my Master’s degree (in Cognitive Science, remember?) I had to do a 6 months internship, whether in a research lab or with a company with strong relation to accessibility. For this internship, I had made up my mind and I knew exactly what I wanted. I wanted to combine my field of study: accessibility ; with my passion: video games in general, RPGs in particular. I wanted to find the perfect video game development studio, one that was currently making a game, one that was currently making a RPG, one that had the will to make their game accessible, and finally one that had the will to take me in (this is actually the most important part, I tell you)! I searched through everything I could find, I submitted dozens of applications to studios that more or less met my criteria. Then, I stumbled upon the Tau Station blog (this blog is so great, read it!). The more I read about the project the more I told to myself, “That is EXACTLY what I am looking for!” I sent an email. The next day, Leila answered. Of all the companies I reached out to, she was the only one to answer positively (if answering at all) to my mail. She proposed a meeting to discuss my internship. I was scared. The meeting had to be in English (I never had a meeting in English before). The appointment had to be via webcam (I never had a meeting via webcam before). And, it was the only positive response I had for my internship (If I messed this up, I was left without nothing). Actually, I was not scared, I was terrified. But it all went well! And one month later, I started to work at Tau Station and was never afraid of speaking in front of a camera in English since. My first mission in Tau Station was, “Play the Game.” I had mixed feeling about this as it was my first time working at home and my work for the first month consisted of playing a game. I was excited, but also a bit nervous, as for me, playing a video game was very far away from the idea I have of working. But I had to do it. After a week of discovering the game, my new boss told me, “Okay, now write a 30 pages long report about the game, we need it to get a grant.” Wow. I didn’t think they could give me such a high responsibility head on, even before I ever did anything for them. They didn’t know what I was capable of, but they gave me my chance. It was such a good feeling. I was so proud to have the possibility to produce good work and to show the team that I could really help them, that I was there to learn, but also to give. It was a great time for me, a real thrill of discovering new things every day, trying to discover every feature of the game as I was writing the report. Thanks to this, I found myself to have a high general knowledge about the game and it helped me throughout all of my internship. Once it was done, the first Closed Alpha Test wave began. I switched tasks and began to work with StarGazer on community management, and with the rest of the team. My first impression with the Tau Station team was that everyone was so kind and helpful to each other. People that I had never met were giving me time to answer my questions and help me out whenever I needed it. It is really nice working environment. Video game development is really different from what I had in mind. And I am lucky to had the chance to witness the routine of a development team. I thought that everyone had their little part, very disconnected from one another, but I was wrong. Everyone is working on the same thing, to a certain extent of course, but different skills from different people are put together to create something incredible. I had the chance to work in several different fields while I only had a unique background. It made me realize that even if you don’t have exactly the right skill to perform a task, you can still do it with enough hard work and the help of the right persons. Last thing I want to mention is you, the players. A game is nothing without the people playing it. And the player base of Tau Station has been amazing. I was constantly in touch with you and I can tell that you are the most dedicated, supportive, and understanding players I’ve ever seen in my gamer’s life. You are always trying to help, trying to find solutions, wanting to improve the game by bringing innovative ideas, and being patient, kind, and understanding with the team. One of the things that did surprise me is how you built your own little tradition of gifting new players showing up in chat. It is really heartwarming to witness the evolution of the Tau Station community via these interactions. Tau Station would be nothing without you, and my internship experience would’ve been way less rewarding if you weren’t part of it. Thank you. 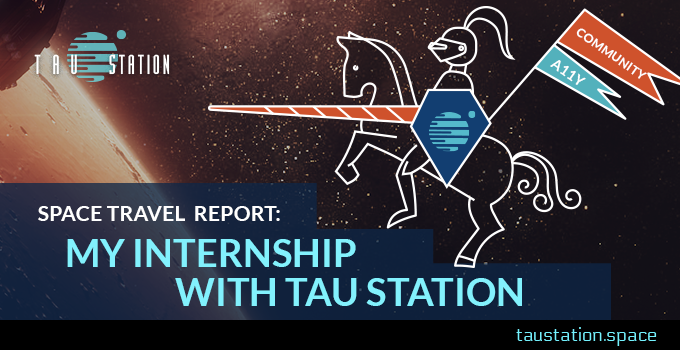 As a takeaway message, I want to thank the whole Tau Station team for giving me an incredible time during these 6 months. I want to thank the players for supporting the game and for being so active on forum and chat, and finally I want to thank Leila who trusted me and who has given me the chance to prove my worth. I leave this place with stars in my eyes and memories in my heart.